Miscreants force halt of user editing. Google is suspending editing in its Map Maker mapping feature after moderation failures allowed rude imagery to appear on its Maps product. Visitors to the Map Maker site are greated with a dialog that redirects them to a page in Google's product forums, advising them they are unable to create new or edit existing mapping projects. The company's product manager for Map Maker, Pravithra Kanakarajan, said the shut down was due to "escalated attacks on Google Maps over the past few months." "The most recent incident was particularly troubling and unfortunate - a strong user in our community chose to go and create a large scale prank on the Map," Kanakarajan wrote. 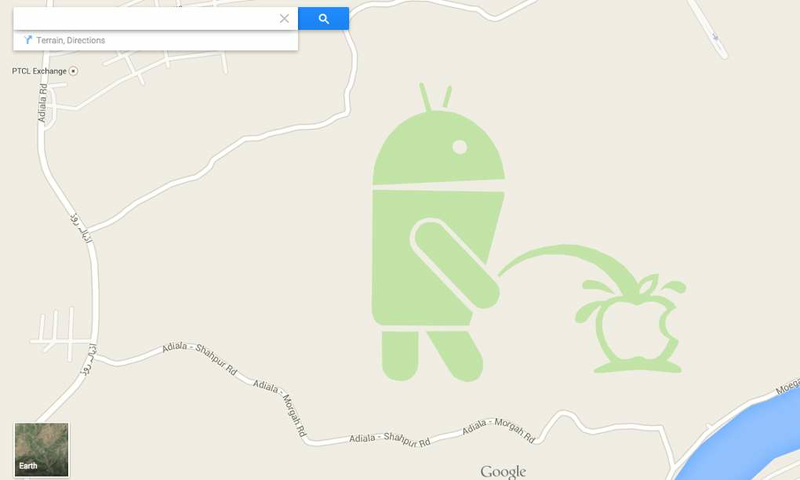 She did not specify the prank in question, but last month, an image of an Android robot urinating on the Apple logo was inserted into Google Maps, near Rawalpindi in Pakistan. The incident created a stir worldwide, and Google removed the image - which appeared to have been inserted by an unknown user to protest against the company's review policy of Map Maker edits. Kanakarajan said auto-approval and user moderation of Map Maker inserts was now suspended while Google figures out ways to "add more intelligent mechanisms to prevent such incidents". Google had changed edits to be manually reviewed, contributing to a large backlog, meaning any user Map edits would take a long time to get published. Since Google does not have the capacity to manually review large numbers of Map Maker edits, Kanakarajan said, it has therefore switched off the feature while it tries to develop an automated system to recognise map-making miscreancy. The shutdown is temporary and applies worldwide, but Kanakarajan did not say how long it will last. Map Maker was introduced by Google in 2008, as a way to gather mapping information from users to fill gaps in the Maps data set. Users could add roads, buildings and other features. In 2012, the World Bank announced a partnership with Google, enabling developing country governments and United Nations agencies to use Map Maker. This allowed the bank and other organisations to access geo data in more than 150 countries for free. While it was nominally available worldwide, Google did not enable Map Maker in nations such as China, Ireland, South Korea, Japan, Spain, Portugal, Israel and Indonesia, among others, for reasons unknown.